As a stopgap, the system restore feature has rescued your Windows quite often after unsuccessful software changes. Still, it really makes itself a burden on the hard disk. If your system is running stably and if it has been a while since you last installed any new software, you can delete all system restoration points except the most recent one. DELETE OLD POINTS: For that, right click the item for your system drive in the ‘Desktop’ or ‘Explorer’ folder and select the context command ‘Properties’. Then right click the button ‘Clean’ to the right below the pie chart for the occupied and free space. The ‘Disk cleanup’ dialog will then appear with a progress bar and the message about the free space potentially available being calculated. This may take a few minutes’. The system dialog ‘Disk Cleanup’ then opens. In that, activate the tab ‘Other options’. If you click the ‘Clean’ button in the bottom most field ‘System restore points’, you will be asked one last security question. Answer this question with ‘Yes’ to delete all old data for the system restoration. 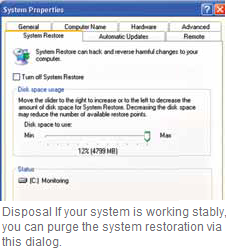 AVOID WASTING SPACE: You can also deactivate the system restore function completely. However, we advise you against it. It would be better to limit the storage space to a reasonable value. For that, open the item ‘System and Security’ in the Control Panel by double clicking it and activate the tab ‘System restore’. In that, you can ‘Deactivate system restore for all drives’ using the option with the same name. Or select an item for ‘Available drives’ and click the ‘Settings’ button near it. In the next dialog, you can either ‘Deactivate system restore on this drive’ or restrict the use of the hard disk with the ‘Amount of memory to be used’ slider.